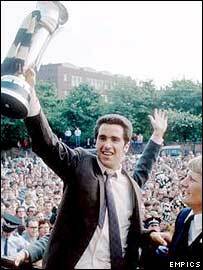 When Bobby Moncur captained Newcastle to victory in the final of the 1969 Fairs Cup he had no idea the club would have such a long wait for more silverware. And the Toon legend is desperate for current skipper Alan Shearer to end the 35-year wait in this season's Uefa Cup. Newcastle play Marseille in the first leg of their semi-final on Thursday knowing they are just three games from an historic win. "I keep saying to Alan Shearer, 'when are you going to win something for Newcastle? ', which riles him quite nicely," Moncur told BBC Sport. "We have this on-going banter because I'm the last player to lift silverware for Newcastle. "I would love Shearer to take that label off me. Shearer in particular because I have the greatest respect for him as a player and as a man as well. "And he is desperate before he retires to win a trophy for the fans of the club because he is adored in Newcastle." Moncur scored three goals in the two-legged final against Ujpesti Dozsa, of Budapest, and the team returned to a memorable reception in Newcastle. "I didn't realise how important it was to win a trophy," added Moncur, who was 24 back in 1969 as Newcastle won their first trophy since the 1955 FA Cup. "But now I'm on the terraces, if you like, as one of the fans I realise how much it meant for the fans to end the wait. I've got the same feeling now that they must have had - I'm desperate for the club to win a trophy." Moncur joined Newcastle in 1962 and made his final appearance in the 1974 FA Cup final, which the team lost to Liverpool. Rated by many as one of the finest defenders in the game, Moncur believes that Jonathan Woodgate is essential to the club's hopes of ending the season with a huge celebration. "Woodgate has given a lot of poise to the team since coming back into the side," he said. "I think he should be one of England's centre-halves in Portugal without a shadow of a doubt. "He is not a great talker and organiser but he is very cool and capable - and just by his sheer presence, he makes defenders around him become better players. "He gives a calming influence to the back four that was missing when he was not playing. "The fact the back four aren't leaking goals like they were gives them a great chance. "If you look at their away form in Europe it has been very good since Woodgate has come back." Moncur felt the disappointment that followed the club's exit from the Champions League earlier in the season as keenly as any other supporter. But he is adamant the team's exploits in the Uefa Cup has put the spring back in the step of the club's devout fans. "It is all picking up and you can feel the buzz. People are coming up to me and saying do you think we can win it?" "I wish I knew that - I would put a lot of money on it." First Newcastle have to see off Marseille - and if they do so will face either Villarreal or Valencia in the final in Gothenburg on 19 May. "It will be a tough tie - and away first is not the best. But as a fan and ex-player I would like to think they will go through. "I don't think there will be a happier man in Newcastle than me if the club won the trophy."